It's a flashback to a bad trip from the 60s: Once again planners are looking for ways to increase capacity on Lake Shore Drive. More than 30 years ago, Mayor Richard J. Daley proposed that Lake Shore Drive be widened and turned into a real expressway, running south through Jackson Park, behind the Museum of Science and Industry, and down Stony Island Avenue to the then-smooth Chicago Skyway. Daley eventually lost that battle--after Hyde Parkers risked arrest by tying themselves to trees along the route--but the war isn't over yet. The latest skirmish was joined this May, when lakefront aldermen received letters from Aristide Biciunas, executive director of the Chicago Area Transportation Study (CATS). Biciunas announced that the state of Illinois is now studying how to make Lake Shore Drive "supplement the expressway system in handling long-haul through traffic," and invited the aldermen to attend an "advisory panel" meeting June 1. In the tradition of Hyde Park resistance, aldermen and lakefront advocates attending the meeting gave the idea a frosty reception. Forty-eighth Ward Alderman Mary Ann Smith advised the traffic planners to "reverse their thinking and reduce, rather than increase, traffic in our neighborhoods and our beautiful park system." (Smith chairs the City Council's Parks and Recreation Committee.) Fifth Ward Alderman Larry Bloom could not attend but wrote, "South Lake Shore Drive was not intended to be a major artery and Cornell Drive runs right through the heart of Jackson Park. As for Stony Island Avenue, since it dead-ends at 56th Street, any increase in traffic on that roadway will either have to traverse neighborhood streets or funnel into either Cornell Drive or Lake Shore Drive." Since then transportation officials have backed off a bit. CATS deputy director Eugene Ryan now describes "through traffic" as cars going only "a few miles on work trips . . . from one neighborhood to another." Traffic engineer Joy Schaad of the consulting firm CRSS of Illinois, Inc. (which is conducting the study), says that Lake Shore Drive already meets or exceeds the standards for the supplementary roads being studied--and therefore "we will not be looking at adding lanes in wholesale fashion." And the fate of Cornell Drive in Jackson Park? "It's too early to talk about that on the record." These apparent concessions have mollified neither the aldermen nor the advocacy groups that joined them. "They argue they're not trying to make it part of the superhighway system," says John Buchanan, alderman of the far-south-side Tenth Ward, "but I'm extremely suspicious of public meetings where they tell you what you want to hear." The Lake Michigan Federation has sounded the alarm to its members in an August "Action Alert" urging them to write or call public officials in protest. Friends of the Parks executive director Erma Tranter has already written to Illinois Department of Transportation Secretary Kirk Brown, asking that he remove the drive from the study altogether because it is a boulevard and a designated scenic drive and should stay that way. She quoted the 1973 Lakefront Protection Ordinance, which says that city policy is to "strengthen the parkway characteristics of Lake Shore Drive," not to beef it up. "The drive is already too big," says the Lake Michigan Federation's executive director, Glenda Daniel. "People come to town and say, 'It's too bad that highway's in the way of your lakefront.'" But often the people who live in town seem to think, "Too bad the lakefront's in the way of our traffic." For instance, a huge expressway-standard four-lane circulation road has been proposed (through the planned gateway park on the Navy Pier headlands) to serve the new Navy Pier; Grand Avenue and Illinois Street are to be upgraded as one-way connectors to help link the drive to the Kennedy Expressway. "All these plans get presented separately," sighs Daniel, "but they have cumulative effects." The two Navy Pier plans are unrelated to the state's ongoing study of Lake Shore Drive, except in their presumption of automotive supremacy. Planners relied on current CTA ridership figures to estimate the road capacity needed at the pier's headlands. And the Lake Shore Drive study itself does not take into account the traffic-discouraging 1990 Clean Air Act amendments or the forthcoming Employee Trip Reduction Program. According to the first issue of an official newsletter on the Lake Shore Drive study, "IDOT and CATS are considering how to incorporate these programs into the traffic considerations in this study." Lakefront developments like Lake Point Tower and the ever-mushrooming McCormick Place have another sinister cumulative effect. Veteran environmentalist Lee Botts recommends a little experiment: Drive the drive, and keep an eye out for Lake Michigan. "See how much of the time you can't see the lake. It's substantial. That's not the way it was originally supposed to be." Every new building makes Lake Shore Drive seem a little more like the Dan Ryan to the casual observer. Officially, Lake Shore Drive has been part of Illinois' "Strategic Regional Arterial System" since April 1989. SRAs are existing major streets chosen to carry that part of the "long distance high volume auto and commercial vehicle traffic" that the freeways can't handle, according to the 2010 Transportation System Development Plan for Northeastern Illinois, published by the Chicago Area Transportation Study. SRAs will get "capacity-increasing improvements" in order to handle this traffic, according to the plan summary. "Possible improvements range from signal synchronization to widening existing roads or building connecting links." Among the 1340 miles of SRAs in the six-county area are Michigan Avenue, Western Avenue, 95th Street, Wacker Drive, Ohio and Ontario streets, and the combination now under study: Lake Shore Drive, Cornell Drive, and Stony Island Avenue, from the drive's abrupt north end at Hollywood to Stony Island and the Calumet Expressway. The idea is to plan and coordinate improvements on these arteries so that they will have what traffic engineers call a "consistent cross section": usually, two lanes each way plus turning lanes. The 2010 Plan is careful to note that in built-up urban areas with "minimal expansion possibilities," its studies will instead focus on relieving "bottlenecks such as intersections, on-street parking and low clearance on structures." But the bottom line remains the same. As one traffic engineer puts it, "They're looking for as much capacity as possible." Terry Fitz, a Lake Michigan Federation intern who attended the June 1 advisory panel meeting, wrote afterward in a memo that on the basis of the hearing it seemed to him that "IDOT, CATS, and their consultants clearly have started this study with a set of predetermined goals and assumptions which are based on a desire for increased traffic flow (including commercial traffic) on LSD" (his emphases). CATS's Eugene Ryan acknowledges that, say, improving the ramps onto the drive "might increase capacity in the sense that it would put more traffic through more smoothly in shorter time. If you improve any route, you might get more traffic on it. The goal is not to increase traffic, but that might be the effect." There are always trial balloons," says Glenda Daniel. "Developers are always interested in 'upgrading' the drive." And you can see why: it is just enough like an expressway to be tempting. Some people want fewer cars on the drive. The Friends of Downtown have long urged that traffic through Grant Park be slowed and that through traffic be systematically discouraged by narrower lanes, lower speed limits, and other restrictions. Less radically, Erma Tranter asks, "Why not have signs posted to get drivers out of Grant Park and off Lake Shore Drive? As long as I've lived here, I didn't realize until recently that you can easily get off Lake Shore Drive and bypass downtown and the parks by taking lower Wacker to the Eisenhower going west. People don't know what the Randolph exit leads to." Similarly, Mary Ann Smith says that parts of her north-side ward have been devastated by heavy traffic from the north end of the drive, while other parts actually could use more cars. "You don't have to go east to go south," she says. "On Lincoln Avenue near Peterson, the businesses are dying. Commuter traffic along there would really help. There's Lincoln, Elston, Ashland, Western--other ways to get downtown. But everyone tells people to go over to the drive." But new signs, new stoplights, even new pedestrian bridges to the lakefront can only be stopgaps. Friends of the Parks complains that the only lakefront master plan relating Lake Shore Drive to the parks is 20 years old. And as long as nearly everybody drives to Soldier Field or the new Navy Pier, the resulting lakeside traffic jams will create demand for a bigger road. The SRA study makes a token bow to public transportation. 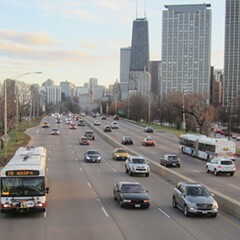 But unless the city, the CTA, the McPier authority, and community groups start planning together to incorporate mass transit into all new and existing developments in the heart of Chicago, sooner or later Lake Shore Drive will become the monster that is already half visible: Interstate 61. And Richard J. Daley, wherever he is, will have the last laugh. Art accompanying story in printed newspaper (not available in this archive): illustration/Slig Signorino. IDOT isn't seriously considering this option, but they should be.